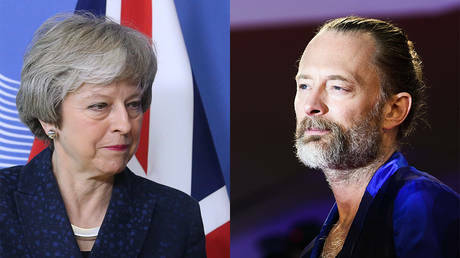 Thom Yorke from British rock band Radiohead has lashed out against Theresa May and her handling of the Brexit process – even going as far as comparing it to the Nazi rule in Germany. Yorke has been a fervent opponent of Brexit ever since the 2016 referendum, boosting a petition to hold a second popular vote. He accuses Theresa May and the Tories of treating the British people “like lemmings running of a cliff,” and has openly mocked the PM on stage. May has been trying and failing to deliver on the results of the 2016 vote and lead her country out of the EU while at the same time avoiding excessive harm to its economy. She has so far failed to broker a deal that would satisfy both the EU and her own lawmakers. The negotiations have been running in circles that look increasingly like a dead-end, with European Commission boss Jean-Claude Juncker recently saying one of the most contentious issues, the Irish backstop, is non-negotiable.